Wheelchairs are used by individuals for whom walking is impossible or difficult due to reasons of injury, illness or disability. Having a wheelchair is very useful in helping yourself get around. As long as you follow certain safety protocols, you should be safe from any serious accidents while in your wheelchair. Here is a list of wheelchair safety tips to ensure you stay safe and enjoy a lifestyle on the go. You must familiarize yourself with your wheelchair’s center of gravity. Try to find your balance by positioning yourself vertically on top of the center of gravity. Use a positioning belt if you need to. Everyday chores might require you to move about, stretch and reach for things and bend forwards or backward. It’s best to rehearse all these movements in the presence of a loved one before going out on your own. A caregiver can protect you from any accidental jerks or mishaps. They can also instill in you the confidence you need to be completely independent. Never put a disproportionately large amount of your weight too far forward on your wheelchair. Instead, position yourself as close to whatever you need to pick up as possible. After that, extend your casters as far away from the drive wheels as you can to create the longest possible wheelbase. Engage the wheel locks to avoid slipping and only then, reach for the desired object. Make sure you only reach as far as your arms will allow you without changing your seating position. Remember to never try to pick something up by reaching between your knees, as there’s a high chance that you may tip forward. Often you would want an assistant to help you with movement if you’re using a non-electric powered wheelchair. Make sure your assistant grasps the back of the wheelchair on a non-detachable part while you are leaning back. Also, it is vital that your hands and feet be clear of the wheels and other pinch points. Wheelchairs are usually equipped with anti-tip bars, so don’t under any circumstances, remove these parts from the wheelchair. If it’s a standard wheelchair, remember to engage the breaks while getting in or out of it. For the electrical variant, the power needs to be turned off while transferring. Don’t attach heavy items (e.g. bag) to the back of the wheelchair as they may cause the wheelchair to tip backward while shifting. The foot and arm rests should be adjusted to a comfortable position so that they don't get in the way while transferring. Some of the most treacherous terrains to navigate on a wheelchair are ramps and curbs. It’s always advisable to go up a ramp only in the presence of a helping hand. However, if you are forced to do it alone, thoroughly examine the ramp for any potential hazards like holes, obstacles, or slippery and undulating surfaces. The same safety measures apply for curbs as well. If you do encounter any obstacles, proceed with extreme caution and go around the obstacle at a very slow pace. Before attempting to try on any steep inclines or declines, do it with someone with you. It’s best to stay on the safe side and judge your own abilities and limitations beforehand in the presence of a caregiver. Moving your wheelchair through sandy or wet surfaces can be incredibly unsafe, especially if you’re seated on an electric powered wheelchair, which moves pretty fast. You can take care of too much speed issues by programming your power wheelchair to never go beyond a certain safe speed. It is highly recommended not to take your wheelchair out when it is raining, or has just rained. Even a small puddle or a wet patch on a sidewalk can cause your wheelchair to get unbalanced and spin out of control. Also, you should never underestimate sandy surfaces. No matter how little sand there is, as the wheelchair can very quickly lose traction, making you to topple over. Another crucial point to remember is, if you’re going out at night, attach a flag to your wheelchair or affix flashing headlights and taillights. This will help people notice you in the dark and prevent possible accidents. There are certain wheelchair safety tips to follow while you’re inside a moving car on your wheelchair. First and foremost, put a tie-down mechanism to fasten your wheelchair to the floor of the car while ensuring the wheelchair’s wheels are locked. It's best to choose a wheelchair with a 'transport safe’ tag. This means that your wheelchair has gone through multiple crash tests and can resist impacts up to 30 mph. Before you embark on a plane journey, try to have your wheelchair completely serviced and inspected. Look for airlines that abide by the Air Carrier Access Act and do your due diligence by reading up on the rules and regulations you need to adhere to while on the flight. Inform the security agents of your limitations beforehand. Remove all the excess leg rests and accessories before handing your wheelchair over to airport staff. Also, keep in mind that wheelchair occupants are always the last to exit a plane, so adjust your travel schedule accordingly. 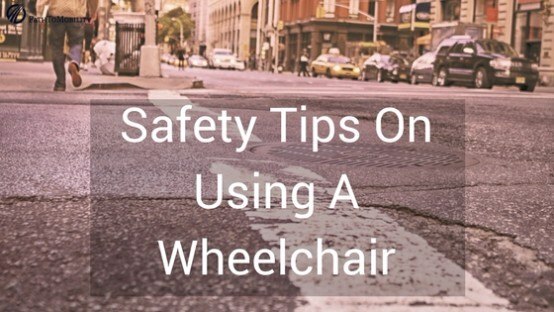 Apart from complying with the wheelchair safety tips mentioned above, it is essential that you keep your wheelchair properly maintained for optimal safety. We suggest that you service it at least once a year or more, depending on your frequency of use. A very common problem with electric wheelchairs is caster flutter, which refers to the sideways movement of the caster while going at high speeds. If you notice any hint of flutter, replace the caster immediately. Keep the wheels properly lubricated to ensure that they lock and unlock effortlessly. Also, check the brakes frequently to make sure they aren’t lax and won’t give away on an incline. If your wheelchair is squeaky or the wheels are sticking to the floor, it’s best to get the wheelchair checked out and get the faulty parts replaced as soon as possible. Commonly replaced parts include the front and rear wheel assembly, seat and backrest cushions, arm rests and leg guards. For power wheelchairs, the batteries have a limited life cycle and need to be replaced quite frequently. Here is a manual wheelchair maintenance checklist that might be helpful. We hope this guide on wheelchair safety tips keep you safe from harm’s way while preserving your independence and active lifestyle. While getting the most suitable wheelch﻿air for your needs is important, knowing the proper use of wheelchair and its safety guidelines ensure a great ride.